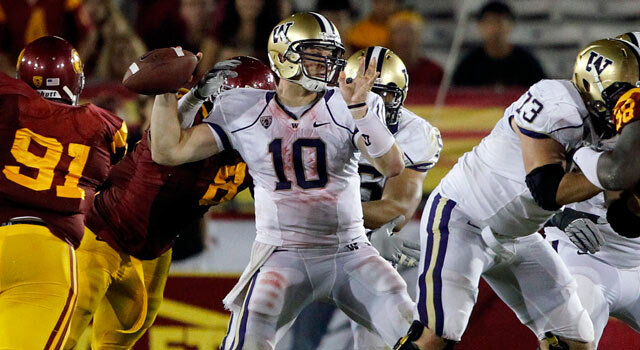 Published: Dec. 23, 2010 at 05:23 p.m.
Once thought of as a top QB prospect, Jake Locker's pro prospects have been hurt by a dismal 2010 season. The college bowl game season is under way, and scouts are jet-setting across the country trying to get one last look at the top college seniors poised to enter the 2011 NFL Draft. These highly anticipated matchups are favorites of scouts because they provide a glimpse at how well draft hopefuls will transition into the league due to the abundance of NFL-caliber talent all over the field. In addition, evaluators will cast their eyes on several underclassmen prospects contemplating early entrance into the NFL, like Stanford QB Andrew Luck. While scouts can't officially evaluate them until they announce their decisions, many will scribble pages of notes in anticipation of their announcements. Given the plethora of bowl games that will televised over the next few days, I thought that I would list five that are on the radar of scouts over the holidays. Scouts will closely tune in to this rematch see if Jake Locker can make amends for a dismal performance in their initial meeting. In that 56-21 drubbing, Locker only connected on 20 percent of his passes (4 of 20 attempts) for 71 yards with two interceptions. He looked tentative and timid against the Huskers, and his hesitation raised serious concerns about his ability to thrive on the next level. Given several weeks to prepare for the rematch, Locker must deliver the goods or run the risk of falling further down draft boards. For the Huskers, Prince Amukamara gets an opportunity to solidify his place near the top of the draft board with a solid performance. He enters the game regarded as the top cover corner available, and another dazzling display of ball skills and awareness will have coaches and scouts around the league clamoring for his services. 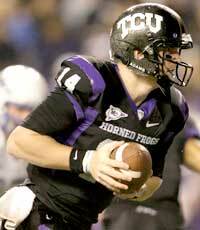 The athletic Andy Dalton has led the Horned Frogs to two consecutive BCS bowl games. The Badgers are loaded with NFL talent on both sides of the ball, but scouts will focus on their offense. Gabe Carimi and Lance Kendricks are early-round talents with the potential to climb up the charts with stellar performances. Carimi, in particular, has made major strides in pass protection, and his ability to handle the Horned Frogs' speed rushers will give scouts a glimpse at how well he would fare at the left tackle spot as a pro. Defensively, underclassman defensive end J.J. Watt will get a chance to showcase his rush skills while chasing TCU quarterback Andy Dalton around in the pocket. Dalton is sneaky athletic and his ability to maneuver as a dual threat on the edge makes him an attractive mid-round prospect in the eyes of some scouts. Luck created quite a buzz while leading the Cardinal to an 11-1 record, but scouts haven't paid close attention to his performance due to his underclassman status (NFL scouts are only allowed to evaluate college seniors until underclassmen officially declare their intention on Jan. 18). With the rumor mill buzzing about Luck contemplating a leap to the next level, several evaluators will be on hand to see how well he performs against the Hokies' aggressive defense. For the Hokies, Rashad Carmichael will get a strong look as a potential No. 1 corner, and he could parlay a strong performance against Luck into a surge up the charts. Scouts will also check out QB Tyrod Taylor to see if he has the potential to crack an NFL roster as a developmental prospect. Teams looking to add a playmaking tight end will likely keep a close eye on Arkansas' D.J. Williams. The Razorbacks have an intriguing underclassman quarterback prospect in Ryan Mallett. Although he hasn't declared his intentions, he has the prototypical NFL size, arm strength and accuracy. With D.J. 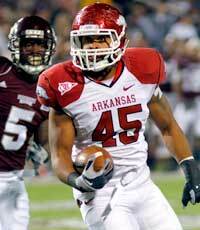 Williams and DeMarcus Love regarded as early-round talents, the focus will be extensively on the Razorbacks' aerial attack. When looking at the Buckeyes, Cameron Hayward will garner most of the scouts' attention. He is a talented pass rusher with the tools to be special, but he has failed to play at a dominant level consistently throughout his career. However, a stellar showing on a big stage could prompt more scouts to gamble on his immense potential. Scouts watching this intense battle will spend most of their time jotting down notes on the underclassmen that occupy key roles for both teams. 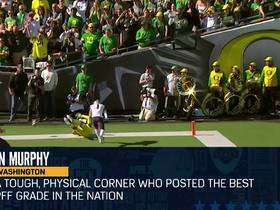 Cam Newton is concluding one of the most amazing single-season performances in college football history, and scouts are beginning to compile their notes on him in anticipation of a potential jump to the pros at season's end. With only one season of major college starting experience under his belt (if he chooses to go pro following the championship game), scouts will pay close attention to his play in this high-stakes affair to see if he has the moxie to be a franchise quarterback. In addition, they will continue to break down his throwing mechanics and fundamentals to see he is a fit in a pro-style passing game. Defensively, scouts will closely scrutinize the play of another underclassman -- Nick Fairley. He dominated the SEC with his rough and rugged style, and his overall game is ideally suited for the pros. If he opts to come out, scouts will undoubtedly place him in the top half of the first round. In looking at the Ducks, all eyes will be on RB LaMichael James. The redshirt sophomore hasn't declared for the draft, but there will be scouts who will want to get an early jump on their reports by analyzing his performance against the Tigers' hard-hitting defense. Given the difficulty in evaluating spread-formation running backs, James' play against an SEC defense will serve as a barometer of his NFL potential.